Heritage Recipe Workshops on some Saturday afternoons. WE ARE EASY TO FIND AT NIGHT, SIGN ON THE STREET IN FRONT. relaxed environment for you to enjoy your cooking experience! We eat what we cook. tasty meal, then we all sit down to enjoy the fruits of your labor with our specially selected house wines. 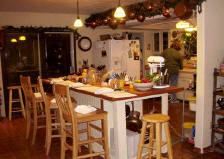 in regular cooking classes, with a hands-on cooking time of about 90 minutes. Enroll securely online with payment handled through Paypal. You do not need a Paypal account for this service. closer than that to the class date, please call for availability. by phone and bring the certificate with you. Please register early so you are not disappointed if a class is filled. AT LEAST 48 HOURS IN ADVANCE OF CLASS DATE. A CLASS YOU MUST CALL. GET IN AT THE LAST MINUTE. after the course has begun. or transferred to another class. We generally require a 6 student minimum. There are no refunds for gift certificates although they are transferable. day you attend class. A coupon code will be provided. 520-797.1677 to subscribe over the phone. wedding showers, business functions, team building, etc. Please call us at 520-797.1677 for more information. is designated by the number of Chefs present. You aren’t scared of anything!